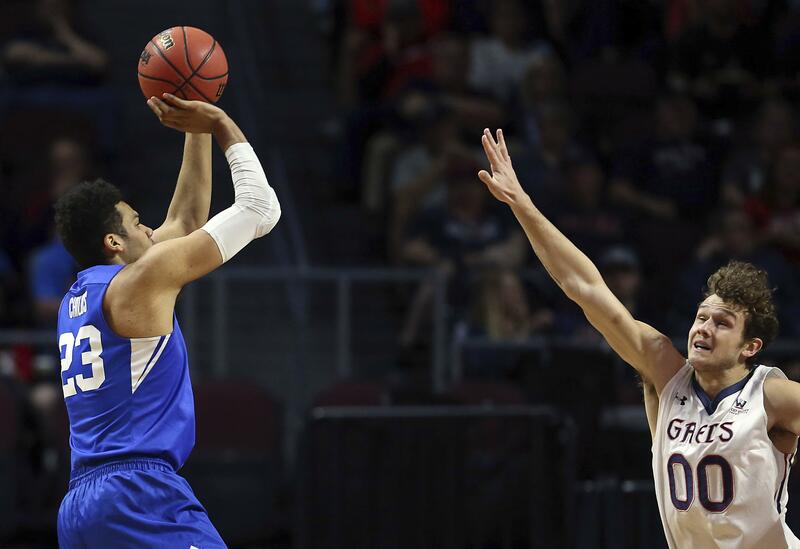 UPDATED: Mon., March 5, 2018, 11:26 p.m.
LAS VEGAS – Yoeli Childs scored a career-high 33 points, Elijah Bryant chipped in 25 and third-seeded BYU beat second-seeded Saint Mary’s 85-72 Monday night in a WCC semifinal game at Orleans Arena. Childs shot 13-of-18 from the field and went 3-for-3 from beyond the arc, while Bryant converted 8-of-8 from the free throw line and managed 8-of-13 from the field. TJ Haws had 11 points and seven assists for BYU. WCC Player of the Year Jock Landale scored 23 points for the Gaels, but played large parts of the game in foul trouble, picking up three in the first half before fouling out with 23 seconds left. Landale, the top rebounder in the WCC, was nudged off the glass by the Cougars and only had four rebounds. BYU (24-9) advances to play top-seeded Gonzaga (29-4) in Tuesday’s conference championship game at 6 p.m. (ESPN). The Cougars played in the title game in 2014 and ’15, but haven’t been back since. BYU made its push midway through the second half with a 13-0 scoring spree that gave the Cougars a 67-54 lead with 9:35 to play. Jordan Ford had 27 points and six rebounds to lead the Gaels (28-5), who are likely assured an at-large bid to the NCAA Tournament. Calvin Hermanson finished with 12 points for SMC before fouling out late. Published: March 5, 2018, 10:33 p.m. Updated: March 5, 2018, 11:26 p.m.